My very first Podcast is now online, you can copy http://feeds.feedburner.com/ProbablyDueToNetworkCongestion and paste it into iTunes for a weird Theremin and Roland MC202 Experiment. Podcasting under the CreativeCommons.org License. I figure its about time I made a Blog post about some of my musical things, I put this together a while ago and its up on the propellerheads site. I actually have a ‘Home Made Theremin ReFill’ in the works but I keep forgetting about it. I’ll hopefully get that released over at the props site too. This was my first Free ReFill. 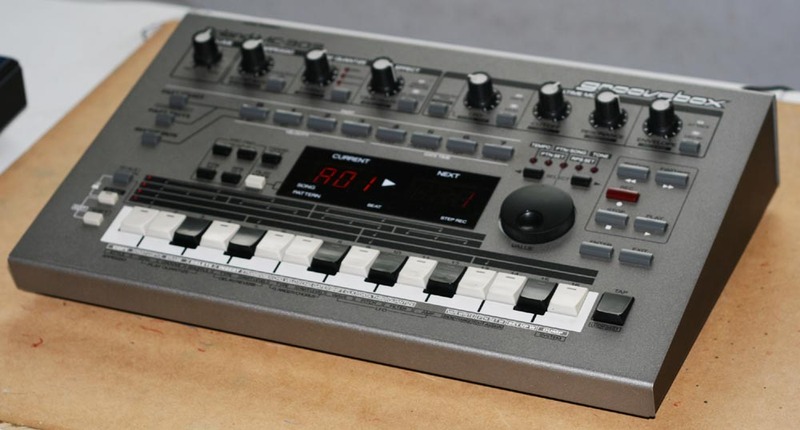 The MC-202 was sort of a next-generation TB-303. So the idea was to program sequence/patterns into it internally which would give you those 303 basslines that we’ve come to love. But programming the MC-202 is a bit too intense and over done for the simple monophonic bass line. However you can control it externally by hooking up a MID-CV/Gate converter. Then you basically have yourself an SH-101! like controls of the VCO, VCF, VCA, LFO, Envelope and Mixer sections. The LCD display is a great feature too. The sequencer is actually a 2-channel CV/gate sequencer, with both channels being capable of driving a separate external synth. It’s a very useful unit, also, for its DINsync capabilities; it can receive on one port, and send over two, and also can ‘split’ DINsync to branch a sync signal out to multiple devices. This machine is best for those who want to get 303-like patterns (it has accent just like the 303) and basslines with an SH-101 sound. If you can handle programming the notes into its sequencer you can have a lot of fun. It is used by Autechre, Future Sound Of London, Coldcut, The Human League, Underworld, Aphex Twin, LFO, Jedi Knights, Plastikman, Astral Projection, Sabres Of Paradise, Freddy Fresh, Jimmy Edgar, ProtoType 909 and Taylor 808. This is a great deal for someone with a PC wanting fast transfer of audio files from the computer, its only ever had light home use and is in great condition, go read the ebay item description.